Completed l972. This was the artist’s very first window composition. It depicts a Milwaukee Electric (TMER&L CO) interurban car that roamed the Wisconsin rails in the 1930s and 1940s. It was made, in part, from opalescent glass scraps from the real cars that were cut up in 1950. 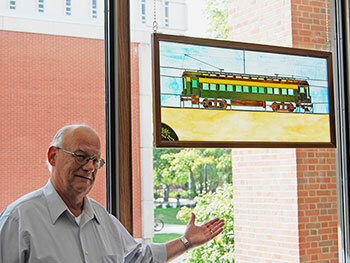 As part of its permanent art collection, this window panel is on display in the Golda Meir Library at the University of Wisconsin – Milwaukee.